You’re an Spotify user (o rdio user) but Apple Music seduced you? The main problem you find is that the playlists that so much effort cost you create in Spotify cannot be migrated to Apple Music except with some applications that being developed. In this post web review one of this applications. 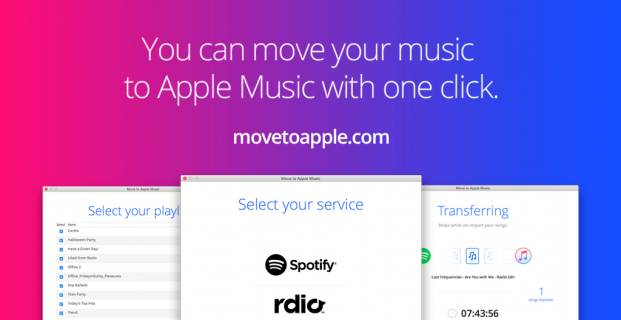 MoveToAppleMusic is an applications for Mac developed by Ramon Fritsch which costs USD $4.99. Until now is the simplest way for migrate playlists from Spotify to Apple Music. Download and install the MoveToAppleMusic application. Select the service from which you be transferring the playlist (Spotify o rdio). Select the playlists you want migrate. A little trick that you need to make: open iTunes and click in the”Capture session” button in MoveToAppleMusic interface, if you see a message click in the heart icon (like) in any song and then click in the”continue” or “accept” button. Click in the “Next” button. By a moment you will see this message. Start the creation of the playlists files. In this window you can see the approximate time it takes and the the progress. Some songs will not be included in the process if the application don’t find it in the Apple Music library. When the process ends click in the”Playlist zip file” button for download a file in zip format. When you decompress this file you get a .txt file for each playlist that you’ve selected in the steep 3. In iTunes go to File>Library>Import playlist… (as you can see in the image in the previous step) for import each playlist. Done! Wait a couple of minutes for to synchronise the new playlists in Apple Music. Now you can access this playlists from an iPhone, iPad, or iPod touch. I would suggest to try MusConv.com tool.